Jackson aka Jax was born in Nathan Littauer hospital on August 20, 2011 weighing a healthy 8lbs 4oz. Throughout the entire pregnancy there were no complications and through ultra sounds Jax was deemed a very healthy baby. Delivery took an alternate turn and Jax was born via cesarean. As soon as Jax was born the doctors and nurses whisked him right away and there were a slew of nurses that had surrounded him. It was later announced that Jax had some complications and the doctors were unsure what was wrong with Jax. 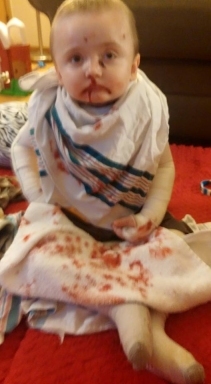 Jax was born with no skin on his fingers, his entire scrotum was a blood blister, and from suctioning his mouth and nose the mucous lining had sloughed right off. When the doctors put the standardized ID bracelet on Jax’s ankle he kicked his legs and peeled the skin off of both heels. The doctors knew right away that there was something extremely wrong with Jax’s skin. Jax was transferred within hours to Albany Medical Center which was 1 hour away from where his mother was recovering from the c-section. Jax was admitted into the NICU for almost 3 weeks, had several tests and skin biopsies. 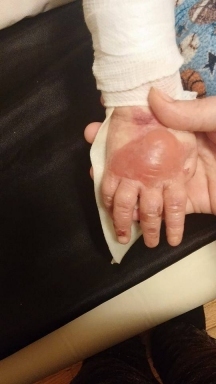 As soon as Jax arrived to the NICU his assigned doctor knew immediately that Jax had a severe skin condition called Epidermolysis Bullosa (EB for short). Biopsies later confirmed. EB is an extremely rare and fatal skin condition that causes the skin and all mucous membranes and internal organs for blister and slough off as a result of a missing protein that binds the skin onto the body, much like the “glue” that holds two pieces of paper together. 1 in 5 million babies are born with this condition and it is undetectable during pregnancy. EB is inherited through both parents carrying a single copy of the faulty gene. Jax’s skin blisters and sloughs off at the slightest touch. His eyes, nose, ears, mouth, throat, entire digestive tract, genital area, veins, and skin are affected. There is a long list of health issues associated with EB and the pain is equivalent to a severe burn victim. The only difference is that the EB skin never heals and continues to blister, fall off, and leave extensive scars. There is no cure for EB and most babies with EB die before their first birthday. 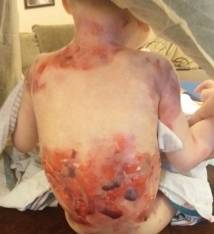 Jax’s subtype of EB is one of the worst there is which in his case 90% of his body is covered in blisters or missing skin and he has extensive scarring throughout his body. He has little to no vision in his left eye, his toes are fusing together due to scar tissue, his tongue is fused to the bottom of his mouth, cheeks fused to his gums, his throat develops strictures which often Jax needs to undergo surgery to dilate or open up his esophagus. Jax eats through a feeding tube that was surgically placed when he was just 1 month old as it is too painful to eat by mouth and causes too much damage. Jax often is admitted into the hospital for aggressive skin infections which at any moment could take his life. On average, Jax is admitted into the hospital at least twice a month for skin infections that require powerful IV antibiotics and steroids. Jax’s entire body must be covered in specialized bandages to heal his skin, prevent infection, and protect his extremely delicate skin. Everyday Jax is wrapped in 4 layers of bandages and must undergo daily bleach baths and dressing changes that take his mother at least 4 hours to complete. This process is so painful that Jax must be heavily medicated with Morphine to take some of the pain away. Jax takes over 40 different medications throughout the day, some as often as every 4 hours. Jax’s condition was so severe that he needed a bone marrow transplant and stem cell transplant to save his life. The idea behind the transplant is to take the donor’s healthy cells and transplant them into Jax’s body so he could start growing more healthy skin. These transplants are not a cure but have improved the severity of EB. Since EB is so rare, there is not a lot of funding to research a cure. The transplants were first done in 2007 and Jax was not only the youngest to undergo these transplants (9 months old), but he was just the 21st child to ever undergo the transplants to treat EB. The transplants are extremely risky, but proved to improve the severity of EB. For Jax, he did not have a choice at the time as he was deemed as “failure to thrive” and was on a downward path. The only place in the world that performs transplants on EB patients is in Minnesota at the University of Minnesota Masonic Children’s hospital, which is over 1900 miles away! Jax underwent 7 days of chemotherapy, 1 day of full body radiation, and so many toxic medications to suppress his immune system in order for his body to accept the donor’s cells. Jax spent a grand total of 11 months in Minnesota, most of which he was admitted into the hospital on the bone marrow transplant floor. Jax had many complications from the transplants and ended up in the PICU (pediatric intensive care unit) a couple times. Jax almost lost his battle with EB on a couple different occasions. Luckily after an 11 month stay in Minnesota and through many ups and downs Jax was given the okay to go back home! This homecoming was however cut short. 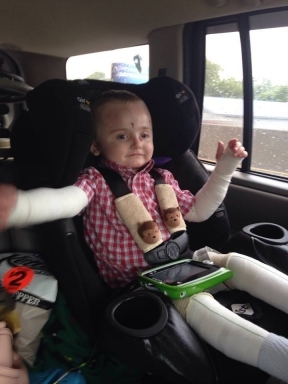 Jax’s body was not accepting the donor’s cells as much as the doctors would have liked. Jax needed to fly back to MN once a month for 6 months to receive a boost of the donor’s cells in hopes to improve Jax’s engraftment of the donor’s cells. After the final boost of donor’s cells Jax was admitted into Albany Medical Center as something went terribly wrong. Jax was bleeding from all of his wounds on his body, having severe nose bleeds, vomiting blood, a blood in his stool. A blood test revealed that Jax’s blood counts were very, very low and he needed several transfusions. Jax’s body was no longer producing blood products and needed daily transfusions of blood, platelets, white blood cells, and several weekly infusions of other blood products and medications. A bone marrow biopsy had revealed that Jax went into bone marrow failure in which his bone marrow stopped producing vital blood products. The treatment for this is to either wait it out and hope it resolves itself and survive on multiple transfusions and infusions daily or undergo a 2nd bone marrow transplant. The doctors had performed every test possible to come up with a cause of Jax’s new bone marrow failure but could not find any cause. Over the next 2 years Jax went back and forth to Minnesota for more tests, was in and out of the hospital almost daily for multiple transfusions and infusions, and hospitalized on multiple occasions for infections in the blood and other blood loss related issues. 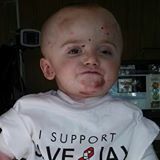 Jax’s bone marrow stopped producing platelets which are the key factor in blood clotting therefore Jax would bleed from every wound on his body, develop uncontrollable nose bleeds, vomit blood and develop spontaneous and dangerous bleeds on his brain. Jax needed a second transplant but was too unhealthy to undergo another round of chemo and radiation. The only thing we could do is try different medications to manage the symptoms and pain. 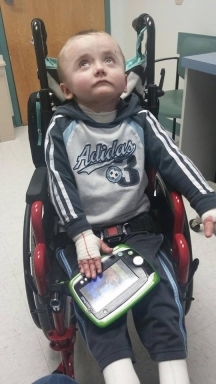 To this day, Jax has received over 400 transfusions and counting. His body has developed many antibodies to blood products meaning Jax can now only receive very special blood as a result of too many transfusions. Jax has a port that was surgically placed which allows direct access to the main artery in his heart to deliver transfusions and infusions, and IV medication. 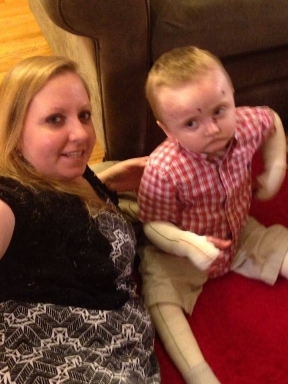 Jax’s skin remains just as fragile as before transplant and blisters just as easily. 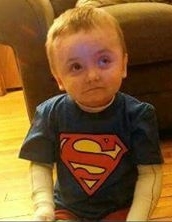 Jax is severely developmentally delayed as he has spent the majority of life inside a hospital fighting for his life. Jax is nonverbal and relies on a wheelchair to get around. He works closely with 6 different therapists that come into his home twice a week. Jax has many, many doctor appointments each week to manage his health. I am Jax’s mother, Jessica. I am raising Jax solely on my own, as his father is not involved in his care. I do not receive any financial help from the father and am struggling tremendously. Jax does have state insurance (Medicaid) however, not too many things are covered and I often receive letters that medical requests and medical stays are denied. The majority of out of state procedures are not approved through insurance and has left me more than $30,000 in debt all of a result of uncovered medical bills. Jax receives monthly bandage deliveries that insurance covers about $1500 a month but does not cover all of the necessary bandages. I rely on donations through medical wound clearing houses and other EB families that live throughout the entire world. Even with this help, not everything is covered and much is out of pocket expenses. There is a long list of out of pocket expenses which include- gas to get Jax to and from his appointments, hospitals, and transfusions, pharmacy; medication expenses which average $100+ a month; bandages; laundry care; cleaning and disinfecting products; specialty home modifications; fans and cooling products for the summer, clothing, special diapers, and so much more! I do not work simply because I cannot work. Jax requires 24/7 wound care as each and every blister pops up needs to be drained with a sterile needle, antibiotics applied, and bandaged in a specialty bandage. Jax’s skin care routine is very time consuming as it takes me at least 4 hours daily to do a full body bleach soak and bandage change. Sometimes Jax requires more than 1 full body change in a day! All therapies are only done in the home as Jax’s immune system is still very compromised. Jax is extremely susceptible to skin infections that could land him back into the hospital therefore everything that comes into contact with Jax needs to be thoroughly cleaned and disinfected. Jax’s situation makes it nearly impossible to get nursing into the home. I do not have anyone that can watch Jax even for me to run to the pharmacy due to the complexity of Jax’s health. The only income is Jax’s SSI disability and limited help through the county. My family has held several fundraisers to help with the expenses but most do not realize that these expenses are forever ongoing. I struggle to pay necessary bills each month such as rent and electricity. A trust fund was set up to help financially with Jax’s medical expenses soon after Jax was born. The trust fund which once housed over $50,000 now contains only a few hundred dollars. Much of the funds went toward Jax’s treatments in Minnesota, with his most recent procedures in March on this year. With all this being said, it is important to understand that Jax is an exceptionally special little boy. He has been through so much in his 3 1/2 years of life and continues to endure so much each and every day. I do all that I possibly can to make sure Jax has the best care possible and is happy. Navigation through all of what my son has been through would not have been possible without help from the entire community. The saying that “it takes a village” is so true for Jax. God’s Compassion – A Hard Pill to Swallow?